1. Preheat the oven to 140°C/fan120°C/gas 1. 2. In a large, grease-free mixing bowl use your Miracle Whisk to whisk the egg whites to soft peaks. (Approx 2 minutes for 3 egg whites) If you add 1 teaspoon of tepid water you will find the egg whites whisk up quicker! While whisking slowly with your Miracle Whisk, add the sugar - 1 tablespoon at a time - until you have a stiff, glossy meringue mixture. Whisk in the vanilla extract until combined. 3. Line a baking tray with baking paper, fixing it in place with a tiny blob of meringue in each corner. Using a metal spoon, place 6 craggy dollops of meringue on the baking paper, well spaced apart. 4. Bake for 1 1/4 hours for mallowy centres, or 1 1/2 hours if you prefer crisper meringues. Peel off the baking paper, and then transfer the mallowy meringues to a wire rack to cool, or leave the crisp ones in the turned-off oven for at least 4 hours to cool slowly, then transfer to a wire rack. Pour the water into the base of the stove-top espresso maker. Then pack the freshly ground coffee into the filter using the back of a spoon. The amount you use really depends on the strength of the coffee beans. Screw on the top and place on the hob over a medium heat. While the espresso is brewing, in a jug heat the milk to just below boiling point, about 45 seconds in the microwave. Once the milk is hot, use your Miracle Whisk to froth the milk. Pour the milk froth into warm cups, and then pour your coffee through the froth. As your coffee goes through the froth it will pick up milk to give you white coffee with a lovely frothy top. Sprinkle with the chocolate. For a perfect Cappuccino add a small amount of milk to black coffee and just spoon the froth on top of your coffee. Use your Miracle Whisk to whisk the ice cold milk to a thick froth, the consistency of cream. Add the milkshake powder or syrup and vigorously whisk. This is delicious espresso with a top of creamy egg yolk and Cognac. Make an espresso. Then take one fresh egg yolk and put it in a glass jug with a small spoon of sugar and cover it with Cognac. Whisk this mixture with toa creamy foam in less than a minute. Now spoon this cream on your espresso coffee and just enjoy it! A well-known 'winter warmer' drinks from Italy. It is usually made with espresso coffee (or sometimes cappuccino) by adding a drop of Grappa, Baileys, brandy or even rum. The secret of a good CaffèCoretti is the "cream" that's added to the espresso. Here are some ideas for great 'creams' to add to your coffee - made easy with the help ofMiracle Whisk. Take your jug and fill it ½ with hot milk and ½ with liquor, sweeten with one spoon of sugar . 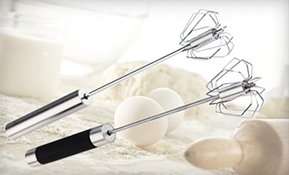 Whisk with your Miracle Whisk. Soon the milk mixture will expand by a factor of four to five times its original size and you will have a delicious "cream". I recommend dbl shot of milk to dbl shot of liquor. Here are some of the liquors I have used; Whiskey, Grand Marnier, Cointreau, Sambucco, Anise liquor, William Pear liquor, Amaraetto, Baileys, Averna, Grappa, brandy,kahlua or rum. Pushed for time? You can use instant coffee to make an instant creamy coffee. Put a small spoon of instant coffee directly into the hot milk and use the Miracle Whisk and you will get a beautiful creamy coffee. Experiment and discover new tastes by using your favourite juices in different combinations, for a vitamin packed, health drink. Tired of paying $4.50 for store brought frappe? With instant coffee, you can make a cold coffee frappe in seconds. Put 1 - 4 teaspoon of instant coffee in your jug, add cold water and sugar to taste, watch as the Miracle whisk thickens to the consistency of cream. Get a glass with ice, spoon cream in glass and pour milk or water through. Use natural chocolate or cocoa - avoid using instant chocolate powders with emulsifiers, which do not froth well. This healthy drink is perfect in the summer with cold milk or on cold winter nights before bed with hot milk. Put a small spoon of liquid honey in a jug add hot/cold milk .Use the Miracle whisk to froth and cream the milk. Take two amaretto cookies(ginger or chocolate biscuits work just as well) and finely crush them. Sprinkle these on top of the frothed milk. Kids love this drink as a caffeine free way of having a "grown-up" cappuccino. Prepare a regular half cup of hot chocolate. In a jug use prepare a small amount of milk add a small amount of sugar if required .Use your Miracle whisk on the milk until a really, thick foam develops. pour the milk into a mug and then pour the hot chocolate through the middle of the thick foam until the foam rises to about a cm above the rim of the glass. Sprinkle with chocolate powder and savour the few minutes of peace as the children enjoy this "adult" treat. In a glass bowl, whisk together egg yolk and dry ingredients. Combine lemon juice and vinegar in a separate bowl then thoroughly whisk half into the yolk mixture. Start whisking briskly, then start adding the oil a few drops at a time until the liquid seems to thicken and lighten a bit, (which means you've got an emulsion on your hands). Once you reach that point you can relax your arm a little (but just a little) and increase the oil flow to a constant (albeit thin) stream. Once half of the oil is in add the rest of the lemon juice mixture. In a large bowl, whisk cream until stiff peaks are just about to form. Mix in vanilla and sugar with your whisk until peaks form. Make sure not to over-beat, cream will then become lumpy and butter-like. Combine all ingredients except olive oil. Mix well with whisk . Add olive oil, and whisk well until combined. Combine all ingredients and combine well with whisk. Refrigerate for at least an hour before serving. Taste and additional salt as necessary. 8-Eggs with egg yoke separated from the egg white. Stuff each chili with Monterrey Jack Cheese and set aside. Next beat all the egg whites with whisk until stiff then add the 4 left over yokes, salt and pepper. Dip each chili into the egg yolk, roll in flour and dip into the egg white mixture. Place the Chile Relleno into the cooking oil, cook until golden brown on both sides. About one minute on each side. CAREFUL to not overcook them. Place on a splatter screen or wax paper to remove excessive grease. Serve covered with a sauté of fresh garlic, fresh tomato, chopped onions and tomato sauce mixture if desired. for rich chocolate use a full bar of chocolate; otherwise use half a chocolate bar. Slowly Bring the milk to a boil, break up the chocolate and stir it in slowly, continuing stirring until all the chocolate has melted. Turn off the burner and use the Miracle Whisk to create a foam in the chocolate. Top with cinnamon and whip cream or top with marshmallows.